Over the years as friends visited the Cleveland area, I've compiled notes with suggestions for what to do and see while in town. Since PyCon is coming to Cleveland in 2018-19 I figured it might be helpful to clean up my notes and share them as a more personalized guide from the point of view of another Pythonista. I hope you find it useful! After a while we started talking about moving and we always seemed to gravitate toward the Pacific Northwest. We'd visit family in Cleveland occasionally and over the years we started to notice that a lot of the things we liked about other cities were here: walkable neighborhoods, locally-owned shops, great food, local beer! Plus housing was a lot more attainable (seriously, take a look at county home values...) Then in 2011 while still fully intending to move to the PNW I was given an opportunity to take a job in Cleveland and I went for it. Since moving back I've tried to treat my city as a visitor would, exploring new places and appreciating what the city has to offer. Clevelanders are at once self-deprecating and fiercely defensive of the city. We get to make fun of it; you don't. There's a division and sort of a rivalry between the East Side and West Side which are delineated by the Cuyahoga river. There was even a "war" fought between the two sides! Public transit is spotty. It is reliable in areas that are served but there are gaps in the system largely due to Ohio's poor transit funding. Still, if where you need to go is on a main line, especially one of the Rapid Transit (Rail) or Bus Rapid Transit (BRT) lines, don't hesitate to use it. Clevelanders love superlative trivia about their city. This is something I noticed after I moved back to the area and I think it's an inferiority complex thing. Anyway, just be prepared to hear about Cleveland having the first this, biggest that, or best what-have-you. Yes, the Cuyahoga River did catch on fire in 1969 (though the photo you've probably seen is from 1952.) This sadly wasn't exactly unique at the time as rivers in many industrial cities caught fire on a regular basis. The reason the Cleveland fire is remembered is because Time Magazine ran a story about it. It's not all bad though because it eventually helped lead to the creation of the Clean Water Act. 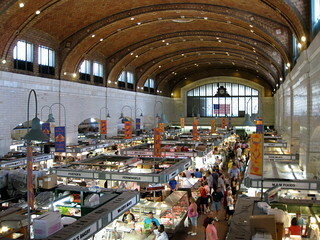 The West Side Market is a historic indoor/outdoor market with produce, meats, cheeses, bread, pastries, and prepared foods. For many people in the neighborhood it is their primary source for groceries yet it has also become somewhat of a tourist location. It's a perfect place to get a sense of the cultural mix of the city. Spend some time just looking around and then grab a bite to eat. I recommend skipping the line for gyros and instead grab a bratwurst at Frank's, falafel at Maha's, or some smokies at Czuchraj (SHOO-cray) Meats. The Cleveland Museum of Art was built during Cleveland's heyday in the early 20th century and maintains a world-class collection. Founded with the idea that a museum should be "for the benefit of all the people forever," admission to the The Cleveland Museum of Art is free so don't hesitate to drop-in for a quick visit to a gallery or two if that's all the time you have. If you're able and museums are a priority for you, I recommend splitting your visit over a couple days and checking out the other museums while you're in the University Circle area. If the weather is ok, take a walk outside and make note of the damaged cast of Rodin's The Thinker with its interesting history outside of the South entrance. Sokolowski's is a restaurant. It's kind of a like a Polish grandma's house — but with a bar, a piano player, and a cafeteria line in which the desserts come first. Trust me on this one. If you go during the dinner rush be prepared to stand in a line that winds back around through the dining room — but don't worry; it goes fast. Be sure to check the specials. No matter what you choose you'll leave satisfied.